The project ended on 25 January 2018 and the full Final Report is now available for download. This summary is a short account of the project’s work. This project planned to develop and evaluate training materials to strengthen dance students’ use of mental imagery, to enhance their creativity. Measures of imagery use and creativity were to be taken at the start of and hallway through students’ first year at University, and again in their second year. Half of the students were to receive training in using their mental imagery, and half were not. We produced a suite of training workshops and materials intended to enhance undergraduate dance students’ understanding and awareness of their mental imagery, and to provide them with the skills to use their imagery to support novel and innovative idea generation. This is thought to be the foundation of creativity. We developed a short pencil and paper test of creativity, the Flexible Thinking Tasks (FTT), to assess changes in dance students’ creativity over the two years of their undergraduate dance education. Students who received the imagery training workshops improved in creativity, while those who did not receive them did not improve statistically (Figure 1). 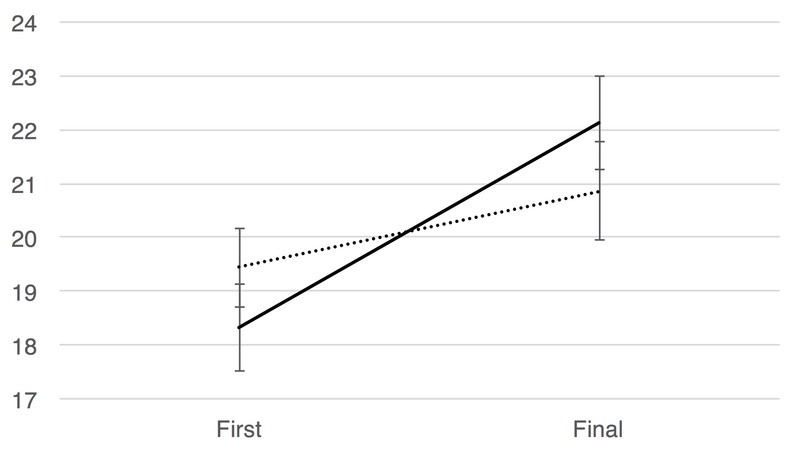 Figure 1: The improvement in Flexible Thinking Test scores over time was statistically significant for the imagery cohort (solid line) but not for the control cohort (dotted line). We analysed the academic feedback on students’ first year choreography modules to measure creativity and use of imaginative ideas. Immediately after the workshops, the trained students scored lower on imaginative ideas, and the same on creativity as the untrained students, but at the final assessment the trained students scored higher on both imagination and creativity. This is important as previous research had concluded that while creativity could be improved through training, imagery had not been found to be successful. Previous imagery interventions had focussed on mental rehearsal, whereas ours trained students in moving between different forms of imagery, helping them to reject conventional ideas and to generate novel, unusual ideas. We also studied the use of routine and novel imagery by dance students and on the vividness of imagery in seven different modalities, but found little association between any of these measures. Lucie Clements and Rebecca Weber completed PhD research on the psychology of creativity in contemporary dance, and in Somatics-based choreographic practices, respectively. The project has so far produced 28 outputs in the form of journal papers, book chapters, and conference presentations, and further journal papers are planned. The training materials are all available for download on the project web site, http://www.dancersmind.org.uk. The Flexible Thinking Test to measure creativity will also be made available to researchers on this site. We have succeeded in enhancing creativity, both on psychological tests and in actual performance. The most successful aspects of the project have been the development of the training materials and the creativity test (FTT); the least successful the canonical imagery (SCI) and use of the imagery vividness (Psi-Q) measures; the momentary ecological assessments of imagery use (EIS) is currently intermediate but when analysis is complete may also prove valuable. In the second year of the project, we have completed the third ‘follow-up’ data collection exercise with Cohort One, providing measures of creativity and their experience of imagery while creating movement. They have now completed their planned engagement with the project and have been debriefed and each rewarded for their participation. We also recruited and obtained consent from a further 228 first year dance students (20 from Coventry and 108 from Trinity-Laban) to take part in Cohort Two. They have been taking part in the same pattern of data collection exercises as Cohort One (recruited the previous year) and additionally took part in a series of workshops between the first and second data collection exercises. The workshops and training materials that Cohort Two received have been designed by the project team to encourage students to use their mental imagery strategically while creating novel movement. Based upon the Mind & Movement materials developed by Wayne McGregor | Random Dance, the project has produced training materials available from the Materials and Videos links on this site. Each student received a set of B6 Flashcards and the Imagination Game during the workshops, as well as being asked to watch the online videos in their own time. Teaching staff at Trinity-Laban and Coventry University received the Teacher’s Guide, the Course Pack, a set of A4 Flashcards and a DVD. Each dance studio displayed an Arcs poster and at least two Principles posters to support the delivery of the training materials in six workshops. The full set of exercises had been designed in a modular fashion to allow teaching staff to select and adapt exercises to meet the constraints of their own curriculum, timetabling and teaching demands, and an agreed set of exercises was chosen by the staff for delivery at both locations. We hypothesised that all students would show a shift from routine and habitual imagery to novel and unusual forms as their skills developed, and that the workshops would allow cohort two students to learn to recognise and elaborate the useful novel images with greater rapidity and confidence, compared to the cohort one students. Our primary means of assessing this is the Flexible Thinking Test (FTT), which includes three verbal measures of flexibility, fluency and originality unrelated to movement creation or dance. We developed five parallel versions of the FTT in the first year of the project, to allow for repeated testing of individuals, and over the first two years the data that we have collected shows that the five versions are equivalent in the range of scores that they produce and that they correlate with a standard ‘single use’ measure of creativity, the Abbreviated Torrance Test for Adults (ATTA). The development of the FTT is itself a major outcome of the project as it will allow future researchers to evaluate changes in creativity within individuals over time, something that is not possible with existing measures. Preliminary results from the FTT show that as expected, cohort one students showed a steady improvement in their creative thinking as measured by these tests over the three testing sessions, from a baseline mean of 26.7 in their first few months as students to 29.5 at the end of their first year and 31.9 midway through their second year. This was anticipated and reflects the focus on innovative practice embedded in the dance curriculum at both sites. Cohort Two performed similarly to Cohort One at their initial testing session (mean 29.5) but following the workshops, had improved to 32.2 at the end of their first year, an improvement which is statistically significant F(1,174)=4.59, p=.034). Their third testing session, planned for early 2017, will show whether this advantage has been maintained or whether they are caught up by cohort one. Nevertheless, we already know that the training materials have successfully increased creativity, in the short term. A particularly important point here is that the FTT produces a ‘domain free’ measure of creativity, unrelated to the domain within which the exercises were embedded. We are in the process of obtaining students’ academic results from the end of year one to identify any specific domain related effects, but this has been complicated by the verbal nature of these assessments, requiring a systematic recoding. We have now completed nine months of our project, and have successfully completed our first two testing sessions, and have obtained creativity and imagery measures from over 100 students at Trinity-Laban and Coventry. As well as John Sikorski here in Plymouth and Lucie Clements at Trinity-Laban, Becca Weber has now joined the team as PhD student working with Sarah Whatley and Sara Reed at Coventry. Becca was appointed a few days before a project meeting in Coventry in January, and managed to fly from her home in the States to join in with the meeting! John, Lucie and Becca have co-ordinated the testing sessions, together with our Cognovo Fellow Klara Lucznik, and have coded and entered the data for analysis. We have yet to complete analysis on the second testing session, but from the first session we already are confident that we will be able to produce academic papers on a new repeatable measure of creativity, based upon earlier fluency of thinking tasks. At the moment we are working intensively on developing the training materials that adapt the existing Mind & Movement Choreographic Thinking Tools for use with in a University context. This is proving challenging as there are many constraints to work within, and we have to strike a balance between producing usable materials that appeal to students and their academic teachers, as well as conveying the theoretically motivated ideas rigourously. We have decided to produce a set of materials that support five 90 minute workshops, but with a modular structure so that teaching staff can adapt and restructure the materials to suit their own needs and timetabling. Our current major target is to complete drafting these materials within the next few weeks so that they can be produced over the summer and used with our second cohort of students, who will be starting their undergraduate courses in September. They will take part on their first testing workshop, as the first cohort did, and then receive the training, before being tested again next Easter. The first cohort will also take part in their final testing workshop in early 2016. It has been a really busy time since our start-up meeting, and I’ve been meaning to say thank you to everyone for giving up your time to help us start things off in a firm direction. With the start of the academic year following on the week after the meeting, I’m afraid this good intention got lost in the whirl of things! Our main focus has of course been planning the recruitment and consenting of the first cohort of students at T-L and Coventry, and deciding upon the content and timing of the first of the longitudinal assessment sessions, which are imminent. We have to be very careful to explain to the new first year students why we want them to consent to take part in the project, what it entails, and how they will benefit from it. The assessment will be designed to fit into a 90 minute session timetabled within a scheduled module, so that all students do attend. We intend to pilot the assessment here in Plymouth with volunteer students from the programme here in late October, so that we can be sure it runs smoothly. It is important to note that we are not assessing the dance that is created, but just the students’ introspections and reports. It will be great when we get to the end of this first assessment period and can relax a bit and start thinking about the development of the intervention workshops, with the modified CTT materials – we have a year to plan these and to practice them with Plymouth students. And of course, there are those research opportunities that give John, Lucie and the Coventry PhD student scope to conduct their own research.